A short post tonight, because writing all of those Dragon*Con recaps was exhausting (but fun!) and also because it is Jon’s birthday. He was the zombie with the creepy Hellraiser eyes who was shuffling alongside me in a lot of my Dragon*Con pictures. Anyways, since it is Jon’s birthday that means more conversing with actual humans and less time typing up manifestos on my blog. So, what does one get her boyfriend who enjoys putting latex and stage blood on his face and who enjoys crafting suits of armor out of Wonderflex and who generally likes all things strange and nerdy? 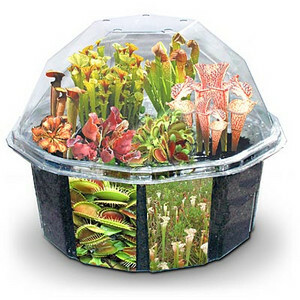 That, my friends, is a carnivorous plant set. You get a little plant greenhouse, a bunch of seeds, some dirt, some fun props like fake snakes and bugs. Put it all together and a few weeks later you get a bug devouring wonder machine of curiosity and awesomeness. I hope. Jon was really enthused by it (yay!) and I am excited to see how the whole set comes together. I’ll probably post some pictures once the plants start growing!